After five years of negotiations, a deal has been struck to sell Russian helicopters to the Afghan leadership. Russia would like to do more to help the country fight the Taliban, but its efforts are restricted by NATO. 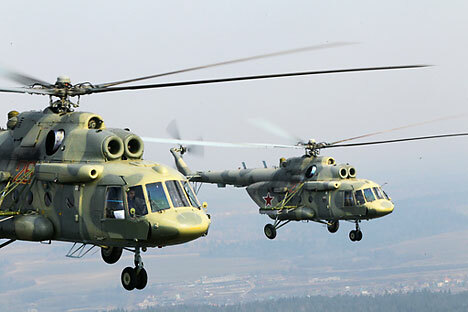 Russia and NATO have reached an agreement to supply 24 Mi-17 multi-purpose helicopters to Afghanistan, Kommersant reported. According to the newspaper’s sources, all details of the deal have been worked out, with final contracts to be signed as of the end of March. The United States, which represented the NATO side at the negotiations, will be the official purchaser of the Russian helicopters. Once the delivery has been completed, the fleet of Russian helicopters serving in Afghanistan’s armed forces will increase to almost 100 units. This means that Russian companies could get future contracts to service and upgrade the machines. The back-and-forth over the helicopters dragged on for more than five years. The Afghan leadership wanted the Russian choppers for their versatility; their better tactical and technical specifications for operating in the country’s thin mountain air; their relatively simple operation; and the fact that Afghan pilots have been flying them since the 1970s. But there was the question of price. Time passed. The helicopters were needed, but couldn’t be taken for free. An agreement was eventually reached whereby the United States would pay for the Russian machines and the NATO countries would later partially reimburse Washington. Moreover, a NATO trust to be launched within a month will finance the maintenance of the equipment. The size of the trust will be finalized once all NATO members have made their contributions. The trust will also be responsible for setting up a service base and a training center for Afghan pilots, as well as for fuel, spare parts, and supplies of weapons. Mostly Russian experts will repair and service the helicopters in Afghanistan, and also in Russia, should the machines need to be repatriated for factory repairs or overhaul. According to 2010 year-end data from Flightglobal MiliCAS, Afghanistan’s air force placed an order for 73 Russian-made Mi-17 helicopters. Some of the machines will be paid for and transferred to Afghanistan by other countries that are not necessarily NATO members. Currently, the Afghan army operates 33 Mi-8/17s and nine Mi-35s. It’s worth noting that supplying helicopters isn’t the only assistance Russia provides to the ISAF and the Afghan army. Although Moscow flatly refuses to send its troops to Afghanistan to help NATO’s international coalition, it does what it can to support the Western forces. For example, in November, Russia supplied Afghanistan’s Interior Ministry with 20,000 Kalashnikov machine guns and 2.5 million cartridges free of charge. At the beginning of the operation in Afghanistan against Al-Qaeda and the Taliban, the Northern Alliance, which was advancing on Kabul together with the coalitions troops, received a large batch of Russian heavy military equipment, including tanks and self-propelled guns, as well as ammunition. Together with its American partners, Russia’s Federal Drug Control Service conducted a raid to eliminate four illegal drug labs inside Afghanistan last October. Moreover, Russia’s Interior Ministry has been training Afghan drug enforcement agents at its Domodedovo facility near Moscow. The help Russia is able to provide to Afghanistan could have been more efficient if it involved the Collective Security Treaty Organization (CSTO), which includes, besides Russia, Belarus, and Armenia, the Central Asian republics of Kazakhstan, Tajikistan, Kyrgyzstan and Uzbekistan. But NATO flatly refuses any such cooperation, arrogantly claiming that the North Atlantic alliance is the only one capable of resolving global strategic problems; sometimes it even serves as a subpar substitute for the UN and its Security Council.